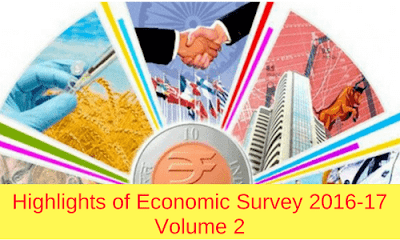 Regarding the Outlook for Growth 2017-18, Survey (Volume I) forecasted the real GDP growth of 6.75 percent to 7.5 percent for FY 2018. As the current inflation is running below the 4 percent target, it suggests that inflation by March 2018 is likely to be below the RBI’s medium term target of 4 percent. consolidation of non-salary/pension revenue expenditure. These reasons allowed the Government to hold the fiscal deficit to 3.5 per cent of GDP in 2016-17.
the fiscal deficit is expected to decline to 3.2 percent of GDP in 2017-2018 and deficit of 3 percent is projected to be achieved in 2018-2019. Restructured the Medium Term Expenditure Framework Statement with projected expenditures. 4. The important fiscal policy initiative is the introduction of the Goods and Services Tax with effect from the 1st day of July 2017.
ii. As of 31st March 2017, currency in circulation contracted by 19.7 per cent whereas reserve money contracted by 12.9 per cent. iii. The average gross bank credit to industry contracted by 0.2 per cent in the FY 2016-17.
iv. The gross non-performing advances (GNPAs) ratio of SCBs, Scheduled commercial Banks rose from 9.2 per cent in September 2016 to 9.5 per cent in March 2017.
v. Zero balance accounts under PMJDY declined consistently from nearly 58 per cent in March 2015 to around 24 per cent as of December 2016.
i. CPI inflation fell to a series low of 1.5 percent in June 2017.
ii. There was a decline in all commodity groups during 2016-17, especially in food. iii. Most States/UTs witnessed a sharp decline in CPI inflation in 2016-17 as compared to the previous year. iv. Both rural and urban inflation has declined in 2016-17 and the gap between rural and urban inflation has narrowed down in recent months.